the mounting of the lighting beams was very easy; even a public official can do this. Enclosed 2 photos "before and after". All my visitors and we the same are excited. Everything worked out fine. The assembly was easy and once we got the hang of the cutting there was nothing that could get into our way. The stucco was very easily painted - honestly, a great product. the mounting of the stucco went just smoothly! I worked together with my all-round craftsman (painter). First made the markings using chalk line and then properly mounted the lighting coves with stucco adhesive and aligned them. I smoothed the stucco afterwards and painted it 2x. 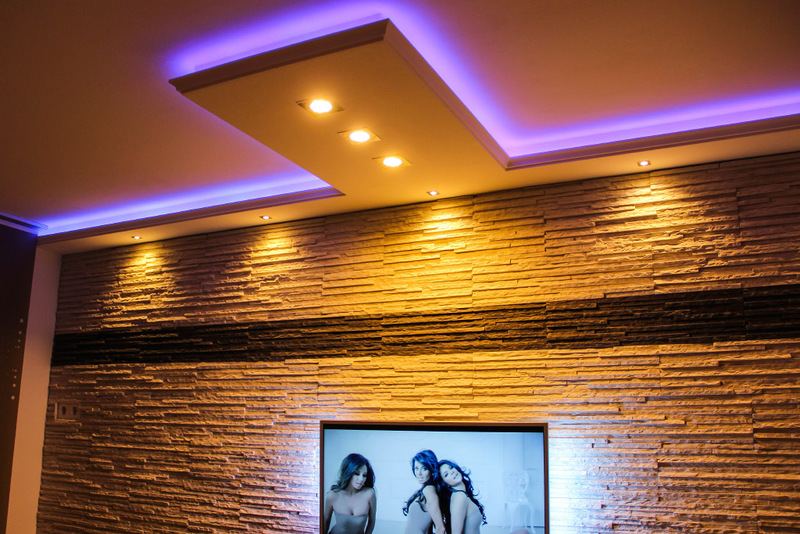 the assembly of the lighting coves for indirect lighting worked out just great, and it looks fantastic; much better still than on the photos. regrettably it is raining in the high north just as well... Well, I am very satisfied with your strips! 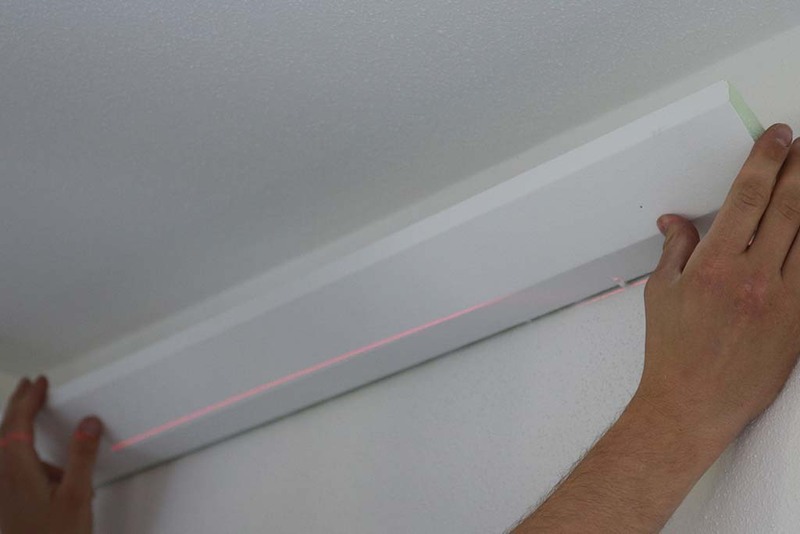 The lighting profiles were easily cut and honed and perfectly attached using the mounting adhesive. The stucco has its price but they are well worth it. This was the perfect solution for me. I followed your advice and installed LED spotlights. Inserted a ventilation grille for replacement and cooling purposes of the transformer. Included a few photos. Thank you very much again and kindest regards from Hamburg! just wanted to drop you a line - in fact, we are still lacking the door to our bathroom, but the rest of the bathroom is done. The stucco has been mounted - absolutely without problems. And we like it very much! I am absolutely satisfied with the quality of the stucco, and also having the corners precut was absolutely perfect! Kudos to you for this! Also the delivery as well as the secure shipment to me was the best bar none! Sententiously - I will recommend you in any case and keep up your quality!!! Included a few photos. It is not yet finished completely, but the lighting effect by LED strips and spotlights is very good already. I need to hone and paint the lighting profiles once more. The mounting of the stucco was a pie using the included adhesive and it worked out perfectly right from the start. We are more than satisfied with the final result and we like it very much! I don't know what to say... THANK YOU, you're faster than a speeding bullet; the precut stucco already arrived yesterday! I will send you nice and informative pictures which you may use for advertising if you want when everything is done. now, after long and tiring days of moving, I finally moved into my new little house. Everything just worked out fine timewise, and I can now have some rest at last. The lighting profiles with their spotlights look fantastic, and I am very happy having made the decision for them. We had some problems installing the stucco at first, but when we found out that they needed to be firmly fixed when sticking them everything was OK. So we glued, fixed, let dry, leveled, ground, painted .... NICE! Will send you pictures this week! as promised, I am sending you a few photos. I must admit that these hard-foam lighting coves have sensational handling features. I will get back to you if I shall ever plan a similar project again. Thank you for your prompt delivery, and for the top-quality product, of course! we are extremely satisfied with your stucco. They were very easy to work with and thanks to the adhesive are very firmly attached. We painted the lighting profiles on the floor (without painting the adhesive area) and avoided the tiring overhead work this way. Thank you very much for the great quality. - we were able to integrate a nice spotlight on one side of the wall as well as an unobtrusive indirect LED lighting on the other side. - and we did a very good job in particular with the integration of the stucco and the curtain rail. thank you so much for the prompt delivery of stucco and the valuable mounting instructions. The mounting of the lighting coves was piece of cake and we did not have any problems at all cutting the miters. 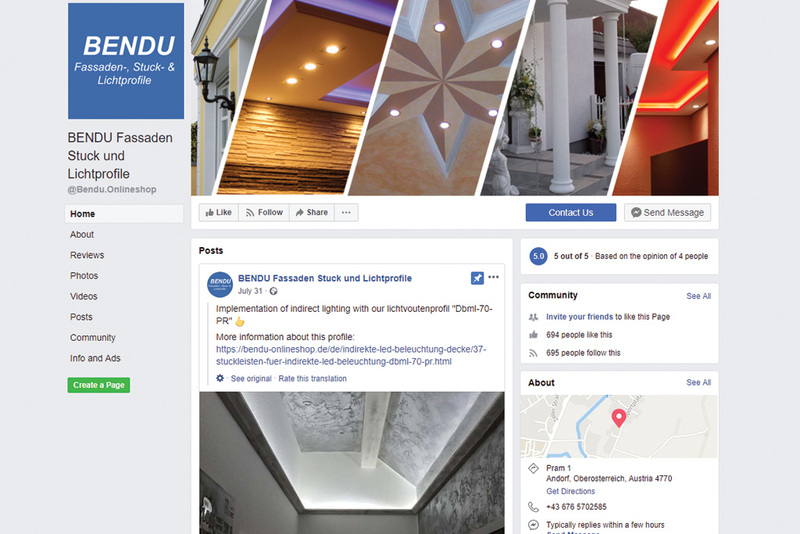 the BENDU stucco for indirect lighting ordered from you arrived yesterday in their expected impeccable quality. This way, I want to thank you for the perfect service. Thanks to your flexibility I wasn't only able to purchase the premium variant of the stucco but I had them delivered to a European foreign country pretty fast and perfectly packed. So secured the stucco could not suffer any damages even from rough handling. Considering further your flexibility when it comes to payment terms, I can only recommend your company unrestrictedly.